As per the information given out by the Center for Implant Dentistry of the University of Iowa’s College of Dentistry, dental implants have incredibly high success rates. Upper implants have a success rate of 91%; lower implants have a success rate of 98%. But not everybody can afford dental implants, not when they usually cost quite a lot. Thankfully, dental implants in US-Mexico border areas offer you a more affordable option. With a number of people without dental insurance in the US and the availability of low cost and high quality dental work across Mexican cities, dental tourism in Mexico is on the upswing. Los Algodones lies near the borders of Arizona and California. So, if you’re from those areas, it’s the best place to go to for cheap dental implants. The salubrious climate of Los Algodones attracts the elderly from various states in the US. In fact, if you consider yourself among those of age, you can get dental implants in Los Algodones, Mexico, as long as your doctor back home sanctions travel. According to the study “Success of dental implants in elderly people-a literature review (2000)” by de Baat C of the Department of Oral and Maxillofacial Surgery and Special Dental Care in the University Hospital Rotterdam, age does not affect the high success rate of dental implants. Tijuana is the financial center of Mexico and holds a global city status. It is home to some of the best hospitals and dentists that can attend to your needs. Tijuana is one of the most famous and visited border cities in the globe. Expect people who can speak English, so you don’t have to worry much about language barriers. You can get dental implants in Tijuana Mexico from some of the best doctors in the country who trained in developed nations. Getting dental implants and crowns in Tijuana can help cut down travel time and costs, especially for the Californians as Tijuana is a mere 17 miles from San Diego, CA. Dental Implants in Ciudad Juarez, Mexico are available at low prices in state-of-the-art facilities. Ciudad Juarez is located very close to El Paso, Texas and it is quite convenient to reach by road. The El Paso international airport is less than 10 miles away from Ciudad Juarez. By getting dental implants in Ciuadad Juarez, Mexico, you would be able to save 20-80 percent on your dental bills. 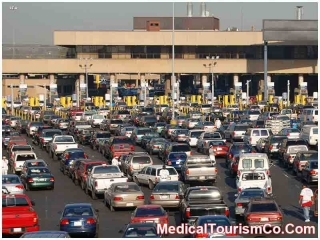 Medical Tourism Co. works with reputed hospitals located close to the US border in Juarez. Getting dental implants in US Border areas cost a lot lower than in the US. If you live close to the border, that’s a bit of travel for a whole lot of savings. Of course, you’d have to take into account various expenditures. Yes, you have to spend for miscellaneous activities including transportation, but cheap dental implants in Mexico allow you afford the entire trip. Your dentist, your hospital, the procedure you’re getting, and the number of teeth to be implanted all contribute to the costs incurred by the end of your trip. Still, you’ll find it all more affordable than getting the procedure done back home. Whether or not to get teeth implants in Mexico depend on where you’re originally from. If you’re close to Thailand, for example, you can get cheap all on 4 or 6 dental implants in Thailand. If you’re closer to Mexico, then that’s the runaway choice. If you can’t decide between getting dental implants in Juarez, Tijuana or in Los Algodones, research more on the cities. In the end, no matter which city you choose, you’re getting affordable dental implants that could change your life. Don’t forget that that if you live far away from the border, it might not be feasible to go back to the doctor who performed the procedure on you. Therefore, you should have a family dentist back home, just in case something happens. You’re in a foreign country that might be far from home – make sure you have the number of your country’s embassy in Mexico and that you know how to get there in case of emergencies. Dental implants in US-Mexico border areas can be the most affordable way not only to get your teeth back, but also your confidence. No need to wear uncomfortable, noisy dentures that have the tendency to slip out of your mouth and embarrass you when you can actually afford a new set of teeth.